This is officially now my go to gluten free dessert recipe. Not only is it super chewy and delicious, it's also really easy and only takes one kind of flour! I've made this recipe in different pan sizes. It makes great bars if you want to do it in a 9x13. Sometimes I've done it without the M&Ms too, as you may recall from this Instagram photo. In other words, just play around with the recipe as much as you want. Have fun. Mix together the soda, salt, and flour and add to the wet ingredients. Mix until well incorporated. Dough will be slightly sticky. 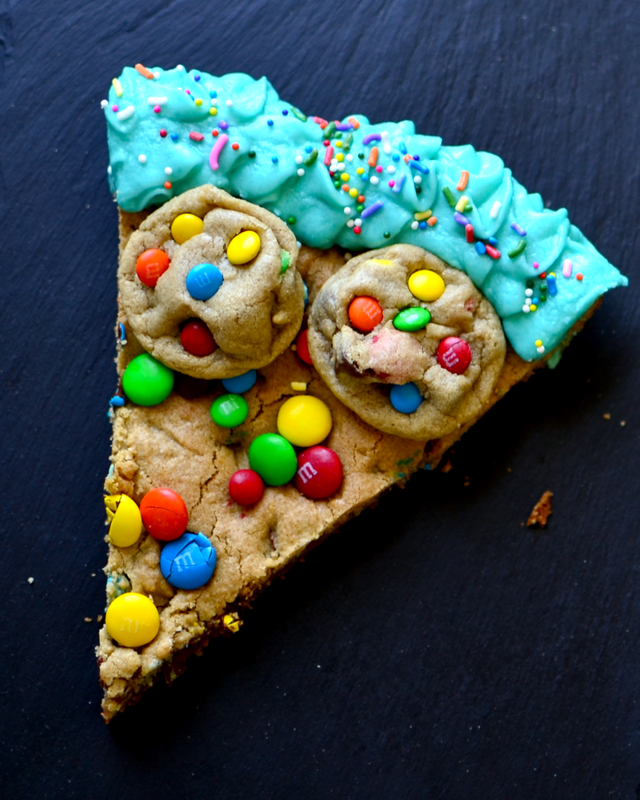 Add the chocolate chips and M&Ms. Reserve about 1 1/2 cups of the dough. Spread the remaining dough into a lightly greased 12 inch round pan . Bake until edges are golden brown (about 15-28 minutes). 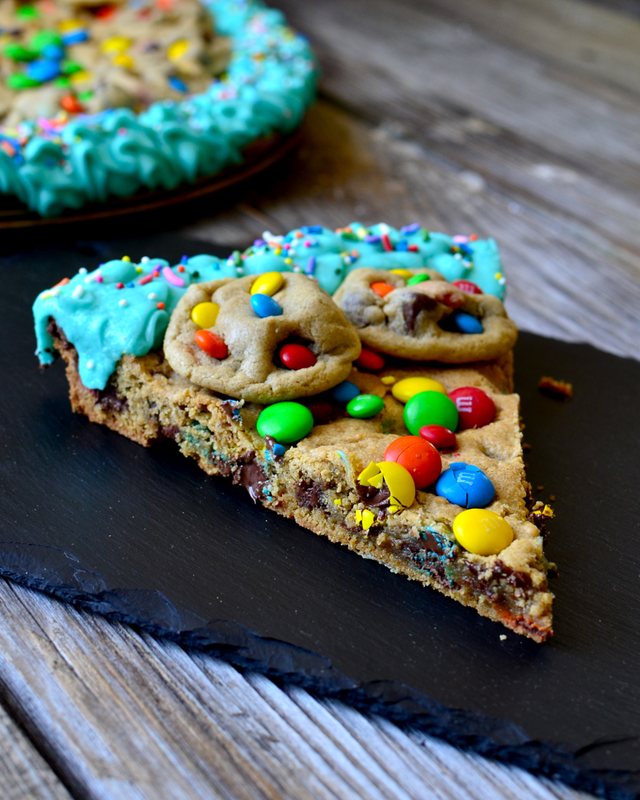 Press more M&Ms into the top for garnish immediately upon removing from the oven. Form the remaining 1 1/2 cups of dough into small cookies and place on a baking sheet. Bake for about 7 minutes or until the edges are golden brown. 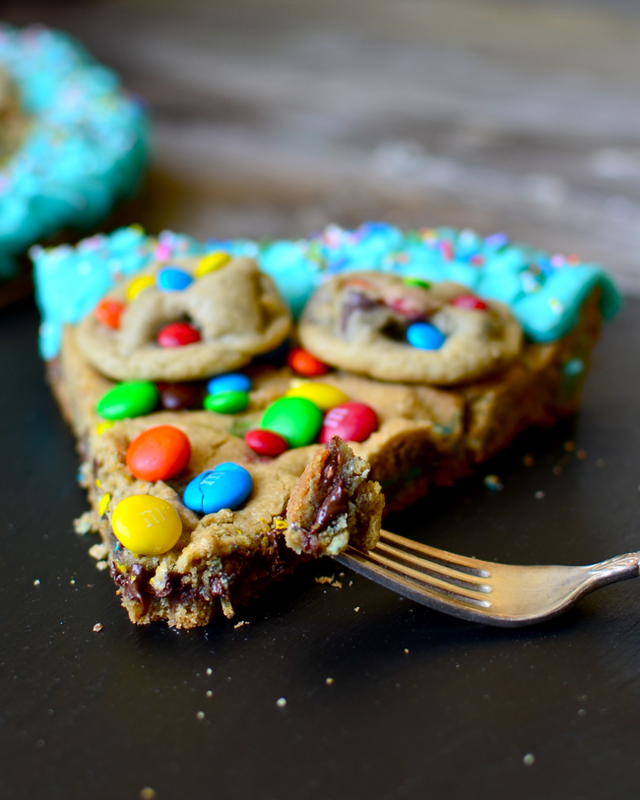 Press more M&Ms into the top for garnish immediately upon removing from the oven. Beat the butter for the frosting until smooth. Alternately add the cream and powdered sugar until desired consistency is reached. Add more powdered sugar if it's too thin or more cream if it's too thick. Add the vanilla and food coloring. Pipe around the edge of cooled cookie. Top with sprinkles. Arrange Mini cookies around the edge for garnish. Don't forget to follow Yammie on Facebook, Twitter, Instagram, and Pinterest or enter your email address in the top right hand sidebar to receive posts in your inbox! Not gluten free? Check out my other blog, Yammie's Noshery! I like this. A lot. You see, I have a friend who knew about Yammie as well as she knew about my Celiac Disease. There's nothing more thrilling for me than to be ABLE TO EAT THAT. And boy. It was tasty. I've made it too, now and also fallen in love with Yammie's Glutenfreedom. Thanks Erica. Thanks Yammie. I have used this recipe several times, probably close to 30, and it always comes out perfectly, no matter how imperfectly I measure. It is amazing. My kids love it, which is why I came back to the recipe today. 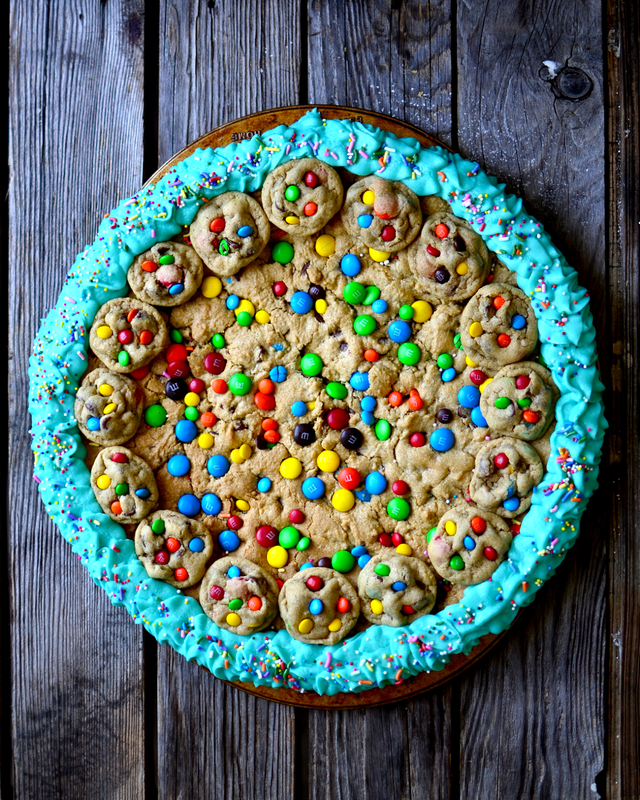 My second-born child (who has Celiac) requested this cookie cake for his 4th birthday tomorrow. Even my nephew who is a big gluten eater loves it!!! 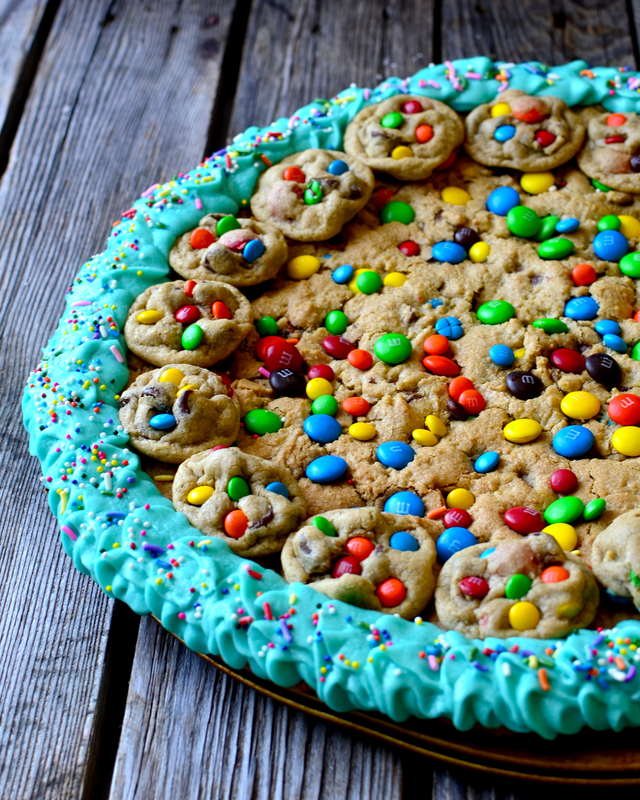 Wow its very yummy cookie cake..
Hi, if I want to do it in a 9x13 pan- do I put the entire amount of dough in the 9x13? Also, what is your baking time for the 9x13? Thanks!